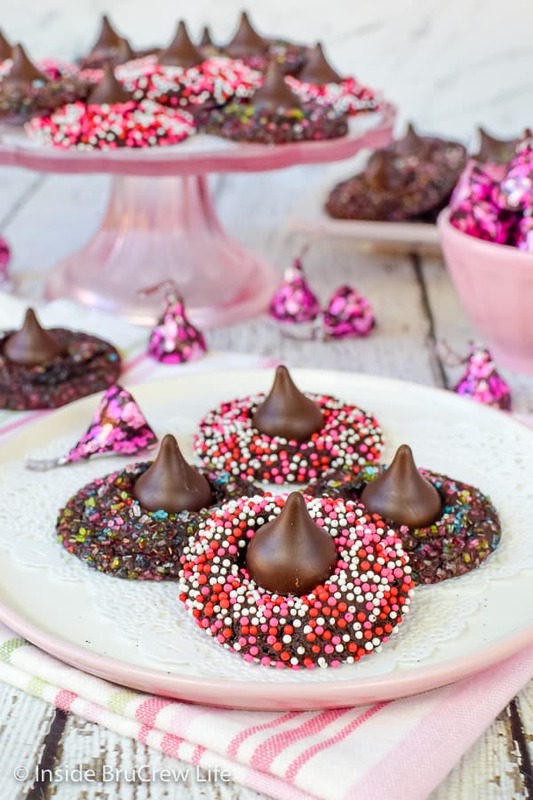 Chocolate lovers will go crazy for these sweet little Chocolate Sprinkle Kiss Cookies. 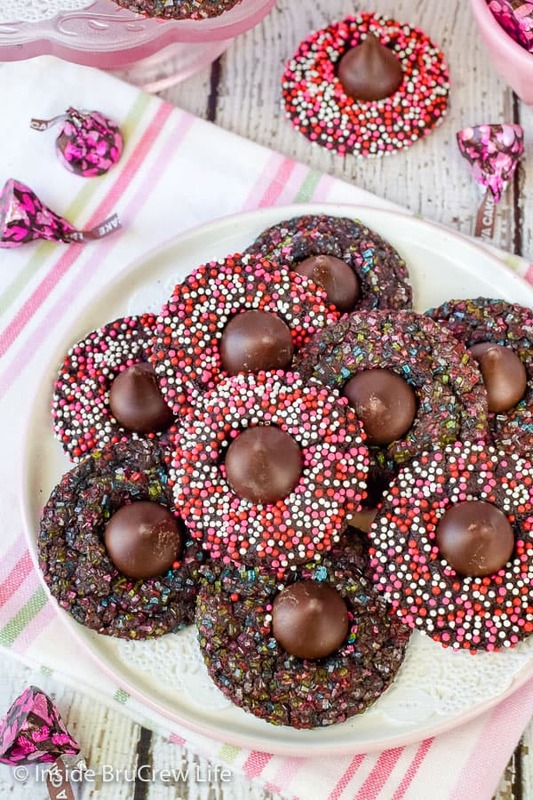 Chewy brownie cookies covered in sprinkles will make everyone smile at. 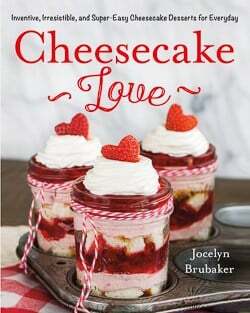 Perfect treat for Valentine’s Day. I absolutely love to bake fun treats for holidays. Well, quite honestly I love to bake treats any time of the year, but that’s besides the point. There is something so fun and satisfying about making a themed treat or dessert. Since Valentine’s Day is so close, I had to urge to make more few pink and red treats this past week. Now usually I try to have a reason like a party, life group, or Bible study when I’m going to make new desserts. This Maple Pecan Banana Bread and this Cinnamon Apple Icebox Cake are a few of the things that I have taken and shared with the ladies in my group for feedback. 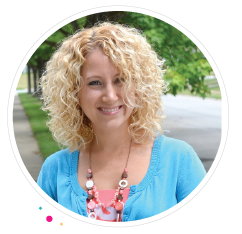 Last week I had a bag of the new Hershey’s Lava Kisses, so I made these easy chocolate cookies and a new Rice Krispie treat recipe for our Bible study. If you can find those new kisses, I recommend buying a few extra bags. They are stinking amazing!!! But honestly, any kiss will taste good on these sprinkle cookies. Our son took the rest of the kiss cookies and Krispie treats to school. This month they have been working on “blog” projects for English, so he has been sharing all about how his mom has a dessert blog. Of course, he said all his friends want him to bring any and all of the extra treats we have to school now. Hallelujah! I am excited to have a place to send all the sweets. No more cookies and cakes staring me down from the counter begging me to eat them. I actually made a version of these kiss cookies a few years ago for Christmas. 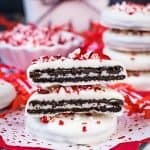 You may remember seeing these Chocolate Candy Cane Kiss Cookies. I love the contrast of the red sugars and the chocolate kisses. This time I decided to roll the cookies in two different kinds of sprinkles because I knew they would look so pretty together. What kind of sprinkles should you use? You want to make sure you use sprinkles that are going to hold their shape and that are not going to melt and make a mess on your baking sheet. 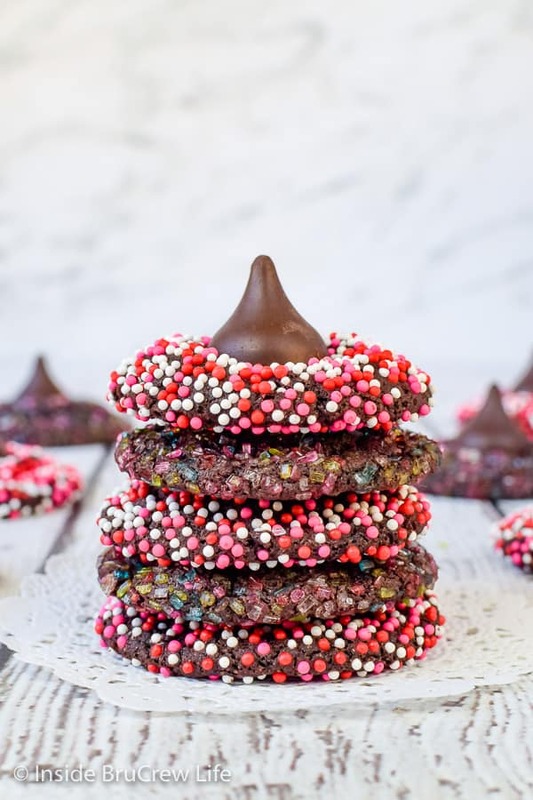 Nonpareils which are the small ball sprinkles and sugars usually work the best for these kind of cookies. Half of these cookies were rolled in a coarse rainbow colored sugar and the other half were rolled in red, white, and pink nonpareils. 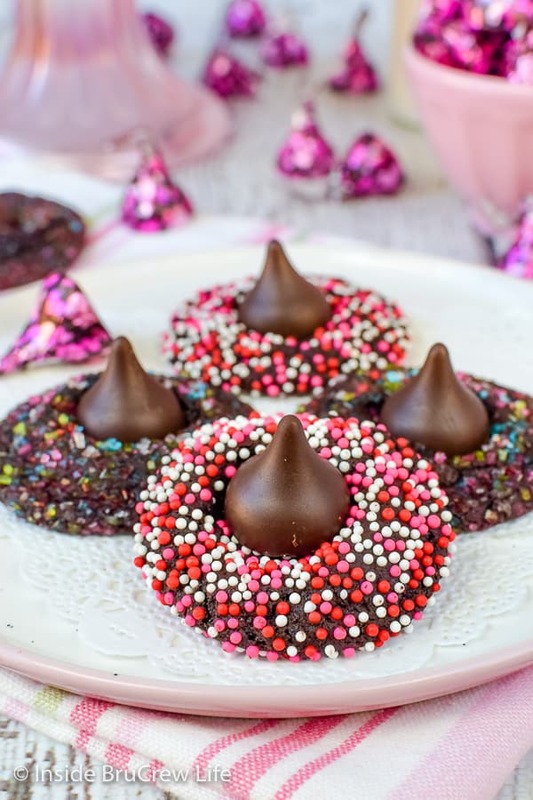 These would make the perfect chocolate Valentine’s cookies for parties! Feel free to change the colors up for every holiday. These would be so pretty in green and white sprinkles for St. Patrick’s Day, in red, white, and blue sprinkles for Fourth of July, or in orange and white for Halloween. You could also roll the cookie dough in powdered sugar instead if you are not a fan of sprinkles. They will look and taste just like chocolate crinkle cookies. 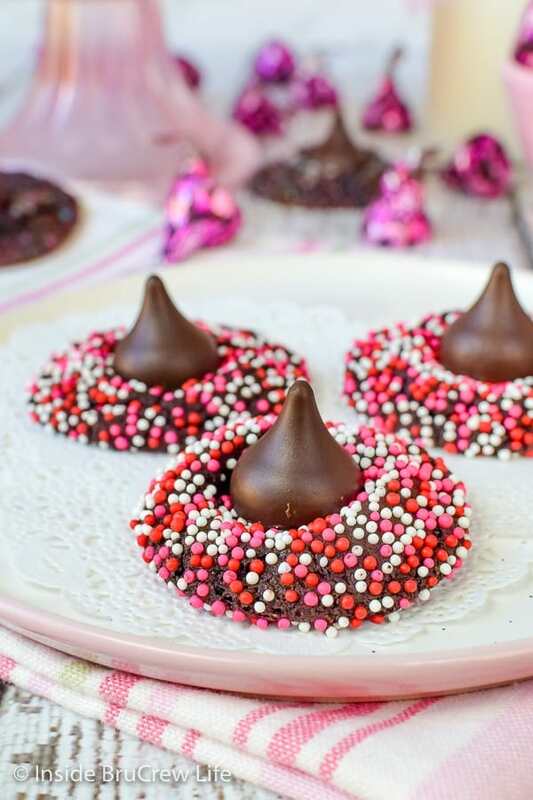 Unwrap your chocolate kisses and place them in a bowl in the freezer. This will keep them from melting into a puddle when you place them on the warm cookies later. Beat the butter and sugars until creamy. Add the eggs and beat again. Stir together the cocoa powder, baking soda, and flour and slowly mix that into the butter mixture. Refrigerate the mixture for 1-2 hours. The cookie dough is very sticky, so this will help you as you roll the dough. Use a spoon to drop 40 spoonfuls of dough onto a piece of wax paper. Roll each spoonful into a ball. The heat from your hands will warm the dough up, so you will need to wash your hands halfway through. Remove the cookies from the oven and let them rest on the sheet pan for 2 minutes before gently placing them on another sheet of parchment or wax paper. 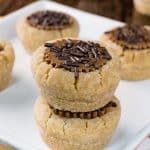 Press a frozen Hershey kiss into the top of the warm cookies and let them sit for an hour or two or until the chocolate is set again. 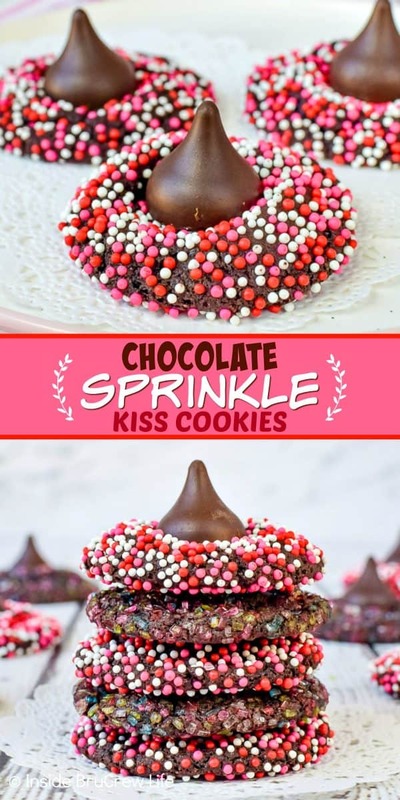 Store the Chocolate Sprinkle Kiss Cookies in a sealed container. If you have any leftover that is. 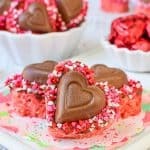 These quick and easy Valentine Peanut Butter Heart Cookie Bars are loaded with sprinkles and candies. 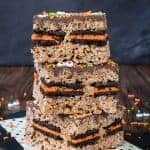 Great treat for parties or peanut butter loving friends! Plenty of sprinkles and candies make this Dark Chocolate M&M’s Popcorn a delicious and fun treat to munch on. 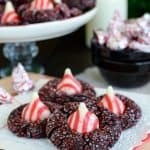 A hidden candy bar and sprinkles makes these Red Velvet Peppermint Pattie Cookies so fun to bite into! 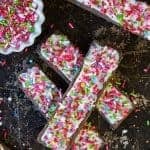 Sprinkles and candy bars on top of this easy Strawberry 3 Musketeers Fudge is a fun way to jazz up a two ingredient fudge recipe. White Chocolate and cinnamon candies make this Cinnamon Sweetheart Valentine Popcorn a sweet treat to munch on. 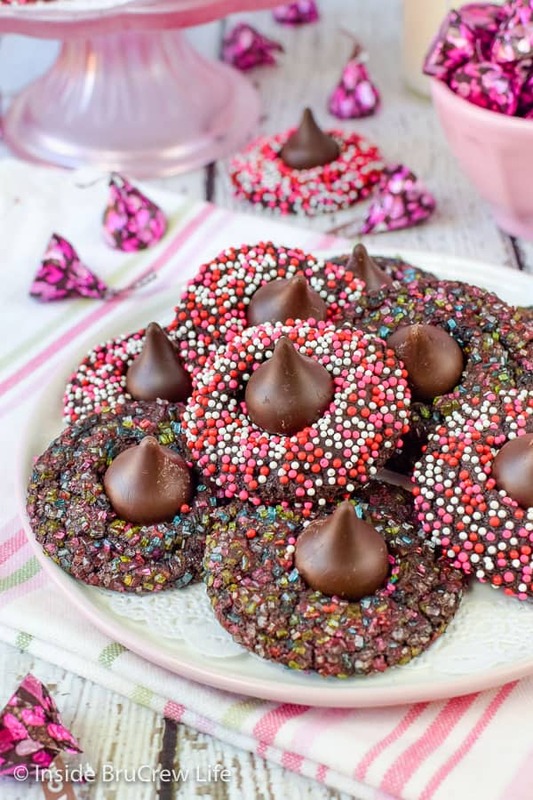 Chocolate lovers will go crazy for these sweet little Chocolate Sprinkle Kiss Cookies. Chewy brownie cookies covered in sprinkles will make everyone smile. Unwrap the kisses and place in a bowl in the freezer. Stir together the cocoa powder, baking soda, salt, and flour. Slowly mix it into the butter mixture. Use a spoon to drop 40 spoonfuls of dough onto a piece of wax paper. Roll each spoonful into a ball. The heat from your hands will warm the dough up and it will be sticky, so be prepared to wash your hands halfway through. Roll each dough ball in sprinkles or sugars. Place on the baking sheet and bake for 8-9 minutes. Remove the pan from the oven and let the cookies cool for 2 minutes. Gently remove and place on a sheet of wax paper on the counter. Press a frozen kiss into the top of each cookie. Let the cookies cool completely before storing in a tightly sealed container. These cookies are so cute! My kids will LOVE them! I loved that these are so easy to make!! They are so cute!